It wasn’t my intention to do two blogs in one day, but you have to strike while inspiration is hot, right?! I had been wanting to try Michael Natkin’s Spanish Lentils and Mushroom Stew from his Herbivoracious recipe book / blog for ages but struggled to find organic french lentils. I finally found them in a big Whole Foods before Christmas in time to make my mushroom and lentil loaf and had some left over, and amazingly had everything else in the fridge to whip this up, and yum! It’s perfect winter deliciousness. I had never cooked lentils until recently because my mum cooked them a lot when I was little and she had my dad on the Pritikin Diet, and I never remember liking them. I always thought they are tasteless and boring. The loaf I made for Christmas was a winner though – very filling and hearty, totally tasty and far from boring; and it didn’t give me the awful gassy feeling that beans do! Then, I looked up the nutritional benefits of these little suckers and was amazed; they’re loaded with iron and protein and do wonderful things like regulate blood sugar and help make happy poops. This is a raw vegan site. Why are you posting cooked recipes? Did I miss something? Lentils can be soaked and used in many recipes. 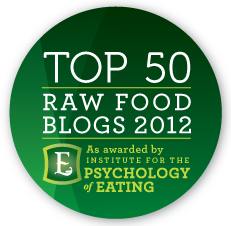 Hi Robin – yes, it started out as a raw vegan site but my diet has evolved / changed as I was starting to eat lots of sugars and fats on a raw diet, and the pressure of 100% raw wasn’t good for my head (see the ‘reflections of a crazy vegan’ sidebar on the blog). I am glad you are posting some cooked vegan recipes as well. Thanks for the positive reinforcement Kat! I’m trying to have something out there for everyone, now I seem to have gotten over the offending-100%-raw-vegans phase ;) Hope you’re happy and healthy!